Don’t get me wrong. I adored the advertising world. The clients, the new products, and the deadlines were all a thrilling rush. But after a few years, that’s all it was – a rush. A blur, really. I’d tinkered with the idea of opening a little tea shop, but until I finally took the plunge, I had no idea what a satisfying life it could be. My little teashop, the Indigo Tea Shop, is tucked along picturesque Church Street in downtown Charleston, South Carolina. With wood planked floors, antique stained glass windows, a stone fireplace, and shelves quite literally sagging with more than three hundred colorful tins of tea, it’s as cozy and quaint as can be. And do you want to know the best part? My teashop has evolved into an oasis of calm - a slightly rarified atmosphere that brings customers flocking for good conversation, excellent food, and fresh brewed tea. Ah yes, the tea. It seems the more I learn about tea, the less I know. We carry hundreds of varieties of Darjeeling, English Breakfast, Ceylon, Assam, Oolong, Formosan, Chamomile, and Japanese green tea. Plus there are the flavored teas. Hibiscus, rosehips, blackberry, wild cherry, citrus, lemon – well, you get the idea. And let me share a wonderful secret with you. The very act of brewing tea, of pouring hot, steaming water on top of fresh tea leaves and allowing them to steep, imparts a feeling of warm, easy relaxation. Inhaling the tea’s essence is a lovely exercise in aromatherapy, and sipping, appreciating, and tasting harnesses all of your senses. Of course, we pride ourselves on serving great food here at the Indigo Tea Shop. Marvelous sweet potato scones, cranberry muffins, banana bread, Devonshire cream, citrus salads, plus delicately cut tea sandwiches of chicken salad, crab salad, and cucumber and cream cheese. All quite delicious. But amidst all this loveliness and calm, a few thorns creep in. You see, I’m a bit of an amateur sleuth. When disaster strikes, I’m often just a few paces away. And with my curiosity amped up, and an uncontrollable itch to test my investigative skills, I often jump feet first into the fray. I suppose that’s what I have in common with a simple teabag. Plunge us both into hot water and you’ll see what we’re made of! 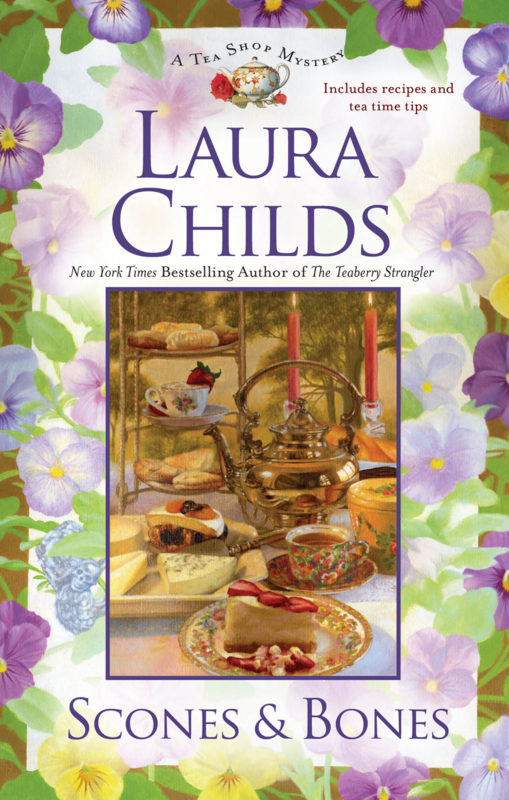 I invite you to follow my adventures, along with more than a few diversions into art, literature, history, opera, and horseback riding, in the Tea Shop Mystery series. Twelve volumes so far and counting, cozy mysteries that are G-rated, for girls to grandmas. 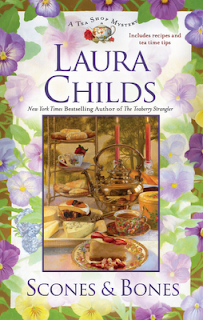 But the Tea Shop Mysteries also deliver a cozy read written with a thriller’s pace – so a thrillzy! Do come snoop with me. Perhaps we’ll even solve a mystery together! Sift together flour, baking powder, and baking soda in a large bowl. In a separate bowl, combine lemon zest and sugar, using a spoon to firmly grind it all together. Add the sugar to the flour mixture and mix well. Cut butter into mixture until you get an even, crumbly consistency. Mix in nuts. Pour in the buttermilk and stir thoroughly until mixture forms a dense dough. Take a good sized lump of dough and gently form into a triangular scone shape. Place scone on a baking sheet lined with parchment, then continue forming scones until mixture is used up. Whisk an egg with 1 Tbsp of water to form egg wash, then brush egg wash on top of each scone. Bake at 400 degrees for 15 to 20 minutes or until golden brown. Thanks for the recipe, Theodosia. It looks great! Now I'm off to brew some tea. Ahhhhh! I adore tea shops! And thanks for sharing the recipe. Yum! You may wish to check out Suzanne Adairs' blog to learn more about tea--the type dumped during the Revolutionary War. Rated G for girls to Grandmas. I love it!